In 2004, I started playing poker professionally. A few years later, I felt empty. I felt like my time with poker had come to an end, so I started looking for opportunities online. On October 31st, 2006, I spent close to $10,000 to work with an internet marketing mentor. In six months, I would be making a living with websites, or at least that’s what I was told. A year later, I was $10,000 short. The promises hadn’t come through. I was frustrated, overwhelmed, and confused. It was partly my fault, because I had put all my trust in someone else. After this “failure,” I felt devastated and hopeless. I didn’t want to do anything. Luckily, a few months later, the inner nudge returned. Between 2007 and 2009, I spent even more money on get rich quick products, hoping to find the “secret” to success. I wanted to make money without putting in the work. I fell into the same trap I did when I spent the $10,000. I bought product after product. I didn’t know better. “There has to be one product out there that can help me succeed,” I thought. You name it and I probably tried it, but I never made any money, because I never focused on one thing long enough to get good at it. At least not until 2009. In March 2009, I stopped playing poker cold turkey and I decided to create my first niche website around a topic I was interested in. I was willing to do whatever it took to make it work. I didn’t know what I was doing, so I found an informal mentor, someone who was making a living with niche websites. As I went through the process of finding keywords, writing content, and building links, I asked for his help. This wasn’t a deep relationship. It was mostly me emailing him from time to time and asking if I was on the right track. Within 3-4 months, my niche site was making $500+ per month. At the end of 2009, I was making $2,000+ per month online and living in Spain with my girlfriend (and our dog). We did eventually move back, but that’s a whole other story. To focus on one thing at a time. Once my niche website was profitable, I moved on to article marketing and affiliate marketing. I built up my income there to around $700 per month and moved on to the next thing that interested me. Many of my income sources from 2009 are still going strong to this day. Looking back, the key to my success was being willing to focus on one project at a time. I had many ideas, and there were many opportunities, but I knew that if I wanted to succeed, I had to make one thing work before moving on. I wasn’t 100% passionate about the topics I covered, but I was 100% passionate about the process of making a living online and building websites. However, even as I was making a living online, there was still something missing. In November of 2009, before we moved to Spain, I registered the domain name WakeUpCloud.com. I felt nudged to share my experiences, so I started this blog without any intention of making money from it. I wanted to share what was going on in my life. The good sides and the bad. On the 5th of December, 2009, I published my first post: The Wake Up Cloud Story. Note that I could not and would not have started Wake Up Cloud back in 2006, because I didn’t believe it was possible. I had to go through the failures and the niche sites to get to this place. You might have to do the same thing. This is why I keep nudging you to take one step at a time and let life take care of the rest. Wake Up Cloud quickly grew from 0 to 1,012 subscribers in 101 days. Once my readers figured out I was making a living online and living in Spain, they wanted to know more. 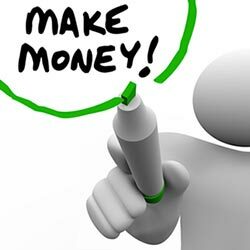 The reasons were simple: the make money online market is not entirely truthful. I had first hand experience with what it was like to fall for promise after promise. Eventually, I realized that the unethical state of online business wasn’t a reason to stop, it was a reason to start. I value integrity and honesty, and if people like me just give up, nothing will change. I still had doubts, fears, and insecurities, but I started anyway. I don’t claim to be an expert, nor do I claim to know everything. I simply share what works and what doesn’t. The more I stepped into teaching how to earn money online, the better I felt. My heart kept saying yes. My readers kept telling me that I had a knack for simplifying concepts and inspiring them to take action. I had a different perspective that people seemed to enjoy. And so do you have a different perspective. Whatever market you want to go into, go into it. Let the doubts be there, but take action. The fact that you are alive means that you have something to share. I have no big mission or goal for Wake Up Cloud. I wake up everyday and follow my inspiration. I follow my heart. And right now my heart is nudging me to help you get paid to do what you love. This is what I’m passionate about. I’m passionate about infusing the make money online space with honesty, integrity, and dare I say, fun. I happily share my mistakes, because I know that my blunders will inspire you to take action. I don’t huff and puff to make myself feel good. I share real stories that inspire you and make you feel good, because in the end, what makes me happy is seeing you succeed. I’ve designed my life so that I have low expenses, which means I don’t have to do any aggressive marketing. We just moved into a new place (a house), yet our expenses are still quite low. This allows me to unabashedly follow my inspiration and passion, and share things from an honest perspective. And, of course, spend time with the little one, or at least try to keep him alive. 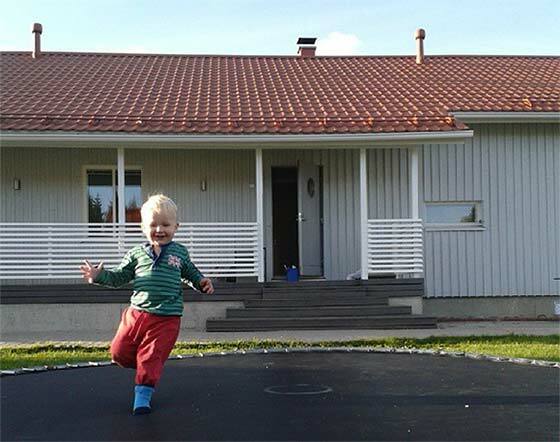 Vincent (my son), jumping on a trampoline in front of our new place. I teach online business because I can’t not do this. I don’t apologize for what my heart nudges me to do, and neither should you. There will always be reasons for not starting, but so what? 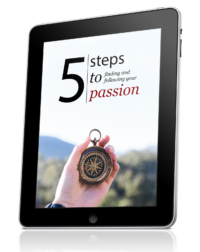 If you want to live a passionate, fulfilling, and meaningful life, you have to start anyway. You don’t have to know where you’re going. You don’t have to be paralyzed by your fears. I started while not knowing anything. I was scared. I doubted myself. But I kept putting one foot in front of the other, and here I am. So really, this isn’t about me, it’s about you. It’s about you realizing that you have to start before you’re ready. You have to be willing to let go of wanting to figure everything out, and you have to just start. I didn’t plan to teach online business. This is where I ended up. You don’t have to plan your life, you just have to live it one moment at a time. Follow your excitement, let go of expectations, and see where life takes you. Its been three years since I’ve subscribed to WUC and all these years I NEVER saw you giving up following your passion whatever the reason may be.Anyone who knows you for quite long enough can understand that you’re DESTINED to be a writer/blogger. It seems there is one moment in all our lives which changes our perspective forever as it is obvious in your case. 1.Unwavering Faith in your abilities-You know what you can do. 2.Integrity-You’re a man of your word and everyone knows that. Therefore everyone can easily trust you! – Always try to create value for others sincerely & wholeheartedly through your gifts( natural talents) and skills ! Keep doing the good work and know that you’re making other like-minded people to believe in themselves and live a meaningful and purposeful life by teaching them to express/share their ideas freely and courageously for the benifit(good) of others! P.S. Vincent is chubby and cute. Give him my love and hugs! Thanks Teja. It’s been fun having you along for the ride! The blogging to make money formula is not the only way to go , actually it’s the hardest way to go. The goal that everybody is after is TO MAKE MONEY, and the problem is that most bloggers want to make it work using the same formula as all the bloggers in the world , they all want to make money writing articles,trying to become famous and have a million followers that they can sell their e books or affiliate products to. But 99% of them will never reach that goal , but they keep on trying, instead of looking for alternative ways of making money using the internet . I tried it and really gave up,don’t like to waist time on something that does not produce, i invested a year . But it was not all wasted time . i learned a lot of how to use the internet and how to make websites. Then i used my new learned knowledge to sell online on my own website , and it was a better experience , i started slowly but within a month i began selling locally , and then nationally and right now i am trying to go internationally. there are many out there , and the internet is just one of them. I couldn’t agree with you more, Juan. We each have to find our own way and what works for us. Listen to people that resonate with you, but don’t get stuck thinking that you have to do things a certain way. 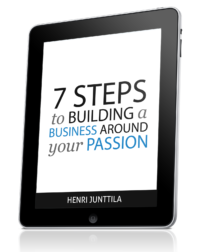 Hi Henri, I have followed you from day #1—- I encourage you to keep doing what you are doing. At least you have found your passion and are doing it…I have so many interests I cannot seem to narrow it down to 1. I live like you do for 7 years now. I am here to inspire you to keep doing what you are doing. I agree with everyone that you have FAITH to move mountains. Your son is proof of that. What helps me narrow down my interests is to focus on the present moment. I look at what I’m excited about doing right now, and what I’m able to do, then I take action. Once I’m done, I repeat the process. It can be a bit counter intuitive for some people. They have this notion that if they put “all their eggs in one basket”, and they fail, their time will have been wasted. Instead they end up wasting a whole lot more time, and learning a whole lot less. Good post, and I definitely agree with you. While I might have wasted some time and efforts doing similar things in the past, I never had the money to spend 10000$ on a mentor, haha. Why didn’t you just spend that money on a site already making like 2k$ per month? That’s a great question, and a great example of how beliefs can stop you from moving in certain directions. At that time, I wasn’t even aware that I could, or wanted to, buy a website. thank you so much for sharing this inspiring story! I found you through our common friend Navid and I’m glad that I took the time and skimmed through your blog! It must be great to make a living with poker but I definitely can understand that you missed the special something. I’m starting with niche sites as well and once I finished my first 4, I switched to affiliate marketing. While the niche sites are (hopefully) rising in Google’s rankings, I’m learning affiliate marketing and not wasting any time where I can’t do nothing for my niche sites. I don’t want to do SEO on them now, because I just launched them two weeks ago. A good and experienced friend told me to wait a month before starting with link building and in this month I’m focussing on affiliate marketing. Poker was great for a few years, but then it was time to move on. And that is the keyword here: move on. To follow what inspires you. It sounds like you’re on that track yourself. Thanks for dropping in, Jan! Ah yes, I made the mistake(?) of starting my new blog and an ecommerce site at the same time. Thankfully the ecommerce advertising/data entry work could be outsourced, but I couldn’t outsource my blog! Now I’m trying to balance 2 blogs, an online store, ebook writing, freelance editing, and a part-time day job! Hopefully I’ll reach a point where I can drop some of the time investment, but that time is not now! Mistakes are never mistakes. On some level, I’m sure you’re enjoying all the activity. Life is never in perfect balance anyway, so you might as well enjoy it. I always enjoy reading your posts, they are very inspiring! Now after taking consistent action for some time and working hard, I can see that it pays off and I’m slowly getting more established and respected for what I do. Though I have a long way to go, but it’s all about the small steps I can take today that will take me to where I want to be in life in the future, just enjoy the journey and the progress! Yes indeed. When you can learn to enjoy the journey, the end goal won’t matter, but at the same time, you’ll make faster progress. Thanks for the comment, Navid! And thank you Stu. You rock! Just dropping in to say congrats on the new house! Looks like you’re in a good spot right now. You really do have an ability to simplifying hard concepts and make them interesting and fun. Dude… The whole focusing one thing at a time helps me A LOT. This message is kind of obvious BUT this post was a reminder to apply it to blogging as well. Good article and very inspiring. I have spent hours and hours reading on how to make money online. I was just waiting for you to try to sell me something, but you didn’t. True blue guy. I realize I need to simply focus and not focus on everything all at once. Thanks.